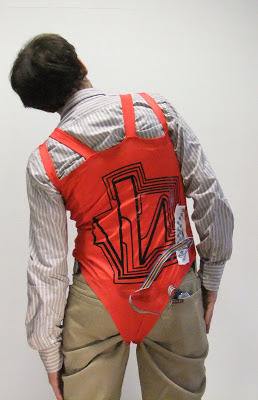 Neurorehabilitation researchers from Italy have developed a low cost, wearable system, consisting of strain sensors made of conductive elastomers printed onto fabric. Researchers have developed a low cost wearable strain sensor that can be used for correcting and rehabilitating physical problems such as posture or flexibility issues of patients. As technology approaches the nano scale, devices are getting smaller and smaller that it can now be integrated into the clothes people wear. This advancement in science and engineering is known as Wearable Technology. The movie Iron Man, can be a model of how far wearable technology can be pushed. Tony Stark, in the movie, creates a wearable suit of armor that has weapon capabilities, computer access, and even grants him the ability to fly and super strength. Although we are not close to building a working Iron Man suit, current advancements in wearable technology has lead to the development of groundbreaking inventions such as Google Glass. Google Glass, commercially available by 2014, is a computer that is built inside the frame of eyeglasses which gives the wearer computer and internet access. Known as augmented reality, Google Glass can assist the wearer in interacting within his environment by providing additional information or recording the moment to the "cloud", an online storage system. Wearable technology can also produce energy for charging cellphones and other mobile devices through piezoelectricity. Piezoelectricity is electricity produced through movement such as walking. The embedded video shows how augmented reality can help and enhance simple daily activities such as shopping or meeting up with friends. Applications for this can be used in the military and industrial sectors. Augmented reality can help soldiers in the field of battle by providing up-to-date information on the situation at hand as well as provide real time information and video on the latest events in real time. Laborers and workers can interact with machines making work faster, safer, and more efficient. Another useful application for wearable technology is in the medical field. Monitors and sensors can be embedded to help people with disabilities like the hearing impaired, the physically handicapped and even blind people. Wearable technology is not only for sports and fashion enthusiasts it can also be used to monitor and aid clinical rehabilitation according to new research published in BioMed Central's open access journal BioMedical Engineering OnLine. Neurorehabilitation researchers from Italy have developed a low cost, wearable system, consisting of strain sensors made of conductive elastomers printed onto fabric. A low voltage battery powers the sensors, which are then able to send data to a computer via Bluetooth. In this case study a wireless inertial sensor (MEMS) containing triaxial accelerometers and magnetometers was used to validate the accuracy of their results. Tested in a healthy subject the wearable sensors were used to collect a comprehensive set of over 600 different movements, at varying speeds and number of repetitions, over a range of movements. In all examples the wearable sensor was accurately able to measure movement. This device will allow remote monitoring of physiotherapy exercises at home, posture, or flexibility during normal everyday tasks. Dr Michelangelo Bartolo who led this study explained, "So far we have only looked at trunk movements, which can be used to monitor flexibility and core stability. This system is not aimed at high precision but is an easy-to-use, inexpensive device, and is a real advancement in the development of portable, remote monitoring of rehabilitation."